Hello friends! I am a little late with my posting but our phone and DSL were down almost ALL afternoon, I know, the horror right? LOL Well, we survived and I am just now getting the chance to post my card for this months PTI Blog Hop Challenge! Our challenge was to find a card that we loved from 2011 and using that card as inspiration create a new card! For my card I used this one that I created using the The Crafts Meow clear set "Make a Wish". 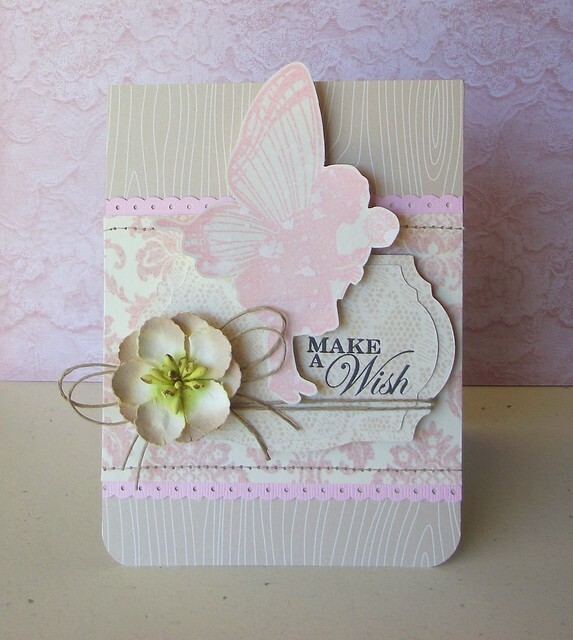 I LOVE this card and wanted to use the soft pink, and woodgrain texture in the creation of my new card. So, here is my NEW card! Sorry for the not so great picture, it rained ALL day today and I had to use my OTT light to take the picture. Anyways, to create my card I used my brand new PTI stamp set "Simply Jane". I knew I HAD to have it as soon as I saw the design team post samples using this set. Such a beautiful set. I cut out the frame with a cutting file from Lettering Delights. I stamped it using Versamagic and heat embossed with gold powder. It looks so much prettier in person! The pretty pink patterned paper is from the Baby Steps collection by Simple Stories. I finished off the card with machine stitching, a vanilla satin bow, and a button tied with Sugar twine from A Muse Studio. That's it for today. I hope you have a great evening! Gorgeous cards Veronica, I would love to open the envelope and find one of these! Love it, Veronica! Isn't 'Simply Jane' the best set ever? 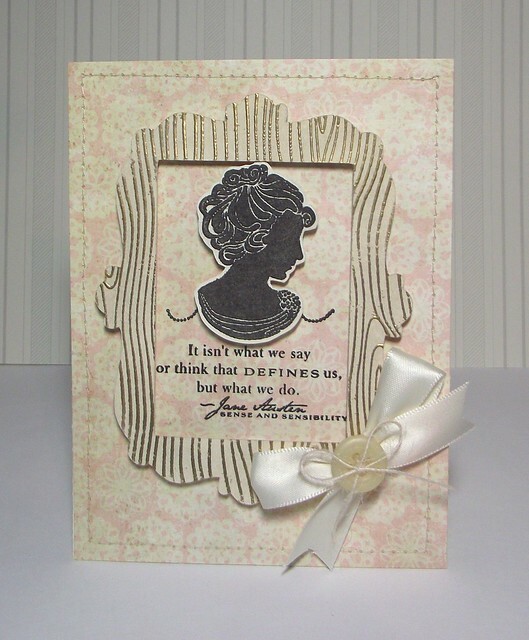 Beautiful card made with Simply Jane. What sweet girly-girl cards! Love the softness of the first, and your second is so elegant with the silhouette in the frame against that gorgeous patterned paper! What beautiful cards!!! I love the softness and sweetness of the first one and I am totally in love with the Simply Jane Stamps!!! Thanks for the inspiration! Love the soft and sweet feeling of both of your cards! Really lovely layering of colors and textures! Two lovely cards with different perspective. Loove them both. I can certainly see why you chose the 2011 project as your favorite! The remake is beautiful, too! Great job on both.